Arkema has planned to invest 300 million euros for expansion of its bio sourced nylon 11 production in Asia. By establishing this plant, the company would increase the global production of bio sourced nylon 11 by 50%. The new plant, which will produce both the amino 11 monomer and its polymer, is expected to come on stream in late 2021. The products to be produced would find applications in electronics, 3D printing and automotive industries. The global castor oil and derivatives market is expected to experience a hike in growth during the forecast period 2016-2024. 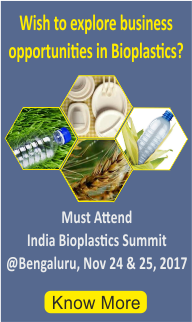 Drivers such as growing demand from the end-use industries such as cosmetics, lubricants, and pharmaceuticals and the growing demand for the products that are biodegradable and sustainable, owing to the reduced petrochemicals dependence could be responsible for the growth of this industry. Over the past few years, there has been an increase in demand for sebacic acid particularly for applications such as textiles, cosmetics, households and others. Increasing demand for textiles has escalated the growth of sebacic acid. China is the leading producer of sebacic acid and exports around 100,000 metric tons. 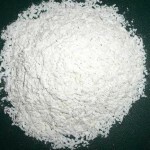 Owing to this, Asia-Pacific is estimated to be the largest market for Sebacic acid followed by Europe and North America. 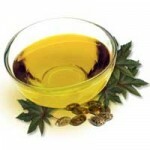 Castor oil is one of the most multipurpose plant oils. 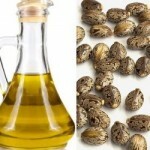 After plant oils, castor oil is considered to be the most required oil. However, growing concerns pertaining to biofuels specially biodiesel and biopolymer across the globe is pushing castor oil to play a much larger role in the world economy. Growth of major end-use industries (lubricants, cosmetics and pharmaceuticals) and increasing demand for sustainable products & biodegradable is anticipated to fuel the demand for castor oil derivatives market. 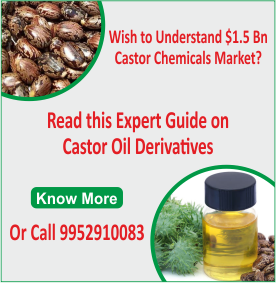 Also regulatory support and rising prices of alternative renewable chemicals is expected to drive the global castor oil derivatives market. 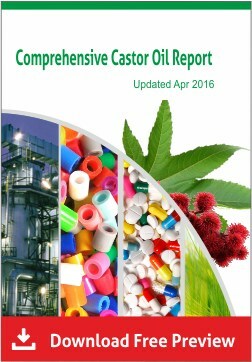 However factors such as manufacturing cost is causing restraints for the castor oil derivatives market. Mitsui Chemicals & SKC Polyurethanes Co. Ltd. (MCNS) a 50:50 joint venture of Japan’s Mitsui Chemicals and South Korea’s SKC will establish a polyurethane system house, MCNS Polyurethanes India Pvt Ltd, in Andhra Pradesh with an initial investment of $ 7.3 million (about Rs 49 crore). The facility to be located at Nellore district will manufacture polyurethane system products and have a capacity of 13,000 tonnes per annum. 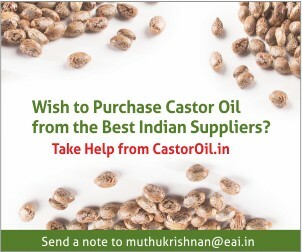 India, the market leader in production and supply of castor seed and castor oil may soon capture a major share in castor derivatives market with companies like Adani Wilmar and Royal Castor Products engaging in second- and third-generation castor seed and castor oil derivatives production and exports. According to industry experts, high technology cost has been the major reason for India in not capturing a large share of the global derivatives market. In the derivatives segment, there is a huge potential for India and focusing more on marketing also could help India shine in castor derivatives market. 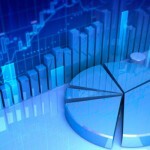 Recent market study has shown that revenue from castor oil and derivatives market could increase in the near future. Sebacic acid and dehydrated castor oil are among the major revenue generators in the global castor oil market. Large-scale adoption of sebacic acid in plasticizers, lubricants, cosmetics is catalysing its growth in the global market. In the end user application areas, cosmetics, pharmaceuticals, surface coatings, plastics and resin industry are the largest consumers of castor oil whereas the surface coatings industry is the fastest growing end-user for the castor oil.